Have you tried to install or update WhatsApp on the Google Play Store but your phone is giving you the error code 11? Don’t worry! I’ll tell you how to fix it. 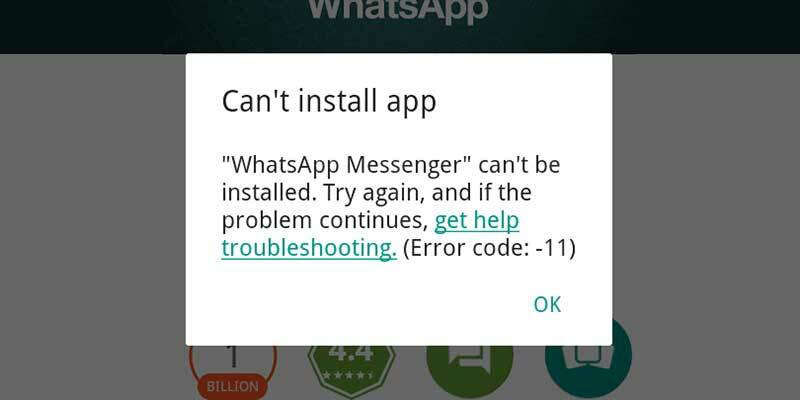 Sometimes, Android devices might give the error code 11 when trying to install WhatsApp from the Play Store, preventing us from using the instant messaging app. However, the solution is very simple. How to fix the error code 11? Check the phone memory. If there is no free space, delete some files (especially videos which take up a great part of your memory). Clear the cache of the Play Store. Go to Settings -> Applications (or Application Management, depending on the phone model) -> Google Play Store -> Clear Cache -> Clear data. Clear the download cache. Go to Settings -> Applications (or Application Management, depending on the phone model) -> Download manager -> Clear cache -> Clear data. Now you can install WhatsApp without problems. Here are all the links to download WhatsApp depending on your phone model.